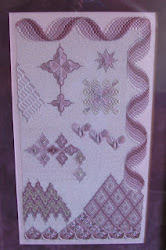 The Royal School of Needlework has started posting photographs of class and student projects on their Pinterest page. If you want to see outstanding stitching, this is the place! I thought you'd love seeing these beautiful needlepoint slippers, dated 1730-40 A.D. They are English, stitched with wool on linen needlepoint canvas, and are from the Victoria and Albert Museum's collection. You can see more about the shoes here. The Detroit News has a nice profile of the teacher and designer Kathy Fenchel on their website. 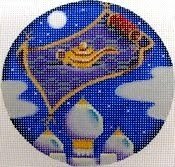 Many thanks to Needlepoint Now for linking to this article. If this intrigues you, you can see some of Kathy's painted canvases on the Quail Run website. They distribute her work. Kathy teaches at Homestead Needle Arts in Michigan. 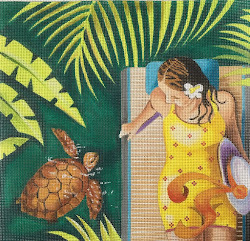 If you aren't close enough to take a class from her, visit her 2006 Stitch of the Month project at the American Needlepoint Guild's website. Even if you don't do her project, you can learn useful things like her turkeywork technique, whipped backstitch and how to add beads to your needlepoint canvas.